Racers often talk about Cold Tire Pressures, Hot Pressures, and Pressure Splits affecting Grip and Balance, but what is really going on? When an automobile runs on a road or racetrack, the tires are subjected to a great deal of loading and deformation. Being composites of man-made rubber, synthetic fibers, metal wires, oils, powders, and natural rubber, there is quite a bit of relative motion inside the tire construction. This relative motion and rubber hysteresis creates heating, which is proportional to the rolling resistance of the tire, and increases exponentially with speed. The tire is subjected to bending and twisting every time it enters and exits the contact-patch. Think of the internal heat generated when repeatedly bending a wire coat hanger. Additionally there is heating due to brake energy. The power required to slow a vehicle can be several hundred, even over a thousand horsepower. This heat is transferred through conduction from the brake rotor, to the hat, then through the hub, and finally into the wheel, where it heats the contained air. A third source of heat is tread friction. The tire to road interface is extremely complex, and depends on many things, including tire compound, road profile, and track temperature. At maximum grip levels and beyond, the tire is abraded from relative motion between the tire and the road. This friction, which can include tearing rubber, causes local heating. Over time, this heat can also make it into the tire cavity, further heating and pressurizing the tire. There are two paths for heat to exit the tire. These include convective cooling from fresh air passing over the tread and sidewall surfaces, and conduction to the road surface. These thermal transfer rates are dependent upon the temperature difference from tire to air, and from tire to track. Obviously, open-wheel cars allow more convection cooling without fenders obstructing the airflow. The tire reaches a steady state pressure only when the total input heating rate equals the total output cooling rate. The first instinct is to simply start with a lower pressure. The problem with a lower starting pressure, is that the tire will have more deflection, more rolling resistance, and more internal heating, resulting in a faster pressure build rate. PV=nRT All other things being equal, absolute Pressure is linearly related to absolute Temperature. 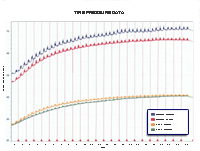 Other properties, such as tire flexing and lateral displacement, can be measured on the rotating tire, and transmitted with Techmor Instrumentation. Techmor uses 2.4 GHz, bi-directional radios, and also allows for multi-point wireless networks. Custom systems can be constructed to measure any physical properties. Visit www.techmor.com for more information.